Of course behind this crime is motive, more profit for landlords by reducing costs and cutting corners. Landlords are a powerful interest, many of whom are Tories with seats in Westminster. But it is the concentration of political power in the hands of the Crown which has made this possible. Ministers of the Crown are taking more powers through the use of statutory instruments to change secondary regulations such as health and safety rules behind the back of parliament. We can trace this story back to 2001 when the Labour Government brought in the Regulatory Reform Act providing wide powers to Ministers of the Crown to make changes by order of statutory instruments. This was replaced by the Legislative and Regulatory Reform Act 2006 which gave the Crown even wider powers. Many statutory instruments are not subject to any parliamentary control. In 2005 they brought in the Regulatory Reform (Fire Safety) order. The aim of this was to reduce burdens on business. From the angle of owners of buildings the major change was the removal of fire certificates with responsibility for fire safety given to ‘responsible persons’ such as landlords. In November 2008 the FBU lobbied parliament to protest against rising fire-fighter deaths. Between 1993 and 2003 there were 6 deaths but in the last ten years there have been 14 deaths. It should be the other way round, like the dangerous sport of Formula One racing which has improved its safety record. By centralising powers, Her Majesty’s Governments’ have cut resources and made working and living more dangerous. The disaster at Grenfell Tower has been a long time brewing. It highlights the absence of popular democratic control and accountability. Local government, in the shape of the London Borough of Kensington and Chelsea, was impervious to the concerns and demands of the tenants’ democratic bodies. The whole of local government is unresponsive and controlled from above by central government. It is did not represent local people and was not accountable to them. Ministers of the Crown, in their Whitehall offices, failed in the fundamental role claimed for the state in ensuring the safety of the people. Westminster did not do its job in exposing the corruption, incompetence and negligence in Whitehall or in passing the laws and regulations to keep the landlord class in check or in jail. This is not something new. The Hillsborough tragedy was not simply down to corruption in policing and contempt for working class fans. The system of government was able to conceal the truth for decades. This is no democracy and finding the truth is like trying to extract blood from a stone. The West London protesters understand facts are concealed. When they ‘stormed’ the town hall one of their demands was to be given a list of tenants or how many tenants were registered there. The Council reps said they were not sure. We will get back to you, sometime-never. This disaster highlights something else. When the state fails, its place is taken by the people, the commons, acting for the common good or the commonwealth. In the vacuum the people came out en-mass and began organising independently to help and support their fellow citizens. The ‘commons’ did not wait to be told what to do. People started organising and protesting. This spontaneous uprising of an alternative self-help is not something simply for the London Borough of Kensington and Chelsea. Any catastrophic failure of government will bring people to self -organise. Democracy provides the only form that can work. The Labour Manifesto has promised more money and an end to austerity but Labour intends to operate through same undemocratic or bureaucratic system of local and national government. This is why we need a revolution in how government and politics works if we are to avoid the same thing happening again. A fire is burning in West London. It illuminates all the injustices of the past 10 years of Tory austerity. 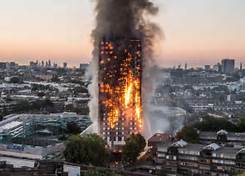 It is a fire that will burn long after the extinguishing of the Grenfell Tower blaze. While the ambulance crews, nurses, fire fighters, doctors, police officers, once again, socially acceptable and are being expediently dubbed as ‘heroes’, our corrupt political class paid these public servants a pitiful 1% pay rise, if they allowed them any increase at all. Their venality was underscored by the free rein given to the friendly print media to trash these overworked public sector workers’ efforts to keep our cash-starved services running. Remember the Junior Doctors’ strike? All the while this ‘least’ corrupt political class in the world helped themselves to 11% pay rises, huge pensions hikes, generous expenses, lucrative second or third jobs on their pals’ boards or, like Damian Green, made millions as they profited from flogging their shares in soon-r-be privatised utility companies. George Osborne should not be allowed to distract us as he hides behind the sensationalist headline of his throwaway evening paper – for he bears the greatest political responsibility of all. With his cuts the banksters and the British capitalist class were able to insulate themselves from their own financial crisis. The relied on Osborne happily impoverishing everybody else so ‘the few’ could continue to thrive. This is the connection between the crash of 2007-8 and the Grenfell Tower disaster in 2017. For Tory cuts were not only to our services, they impacted severely on vital regulatory frameworks we all rely on. There was the systematic pillorying and ridiculing of ‘health and safety culture’ (EU imposed of course) throughout the period. So grabbing some lowly tower hall officials will not be enough to dowse the fire this time. The politicians and CEOs of all companies concerned must be held accountable. We need a public inquest not a public enquiry. As Marcia Rigg, long time witness to another case of burning injustice has said, No Justice, No Peace’.